Have you all seen Sia's new video, "The Greatest"? The young dancer that's in all her videos (Maddie Ziegler) is leading a troupe of young dancers, they are all dancing and having fun, and at the end, they all drop to the floor, revealing bullet holes in the wall behind them. It's a tribute to the Orlando Pulse victims. Ok, so here is the story behind the Nena concert. Got to the Playstation Theater 30 minutes before the doors opened, and people on line were very friendly. You could see who had purchased "meet & greet" tickets, as they were carrying their memorabilia with them, just as I was. The theater had a large empty floor in front of the stage, then another section of floor that was raised up by a flight of stairs, and behind that a section of seats. By the time the lights went down, both sections of floor were filled, and a number of seats were taken. Nena made the concert a family affair, her background singers were her twins, daughter Larissa Marie and son Sakias Manuel. Nena mentioned from the stage that Larissa is the mother of two, and Sakias the father of one, and that she is enjoying being a grandmother at 57. Nena opened with her latest Euro hit, "Genau Jetzt" ("Right Now"). After she finished, she said she hoped we didn't mind that she would be singing in German. Of course, we didn't care. Near the middle of the show, Nena sat and talked with us, and said she wanted to do a "minute of silence" because there is so much trouble in the world, she just wanted us to be silent for one minute, and concentrate on putting good vibes out into the world. After the minute passed, she played her song "Wunder Gescheh'n" (Miracles Happen). 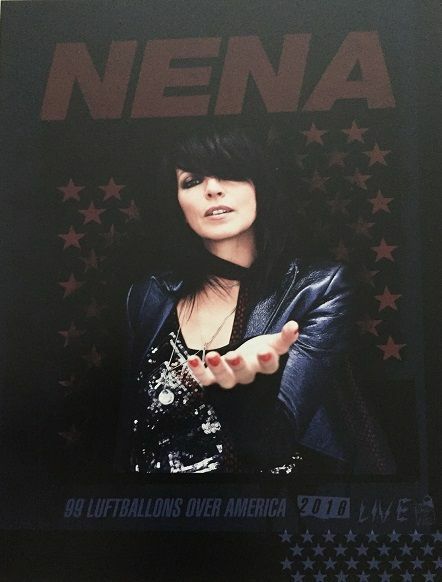 While we all know Nena for new wave, the show was definitely a rock show, with most of her music getting a harder rock cover than the versions on the CDs. 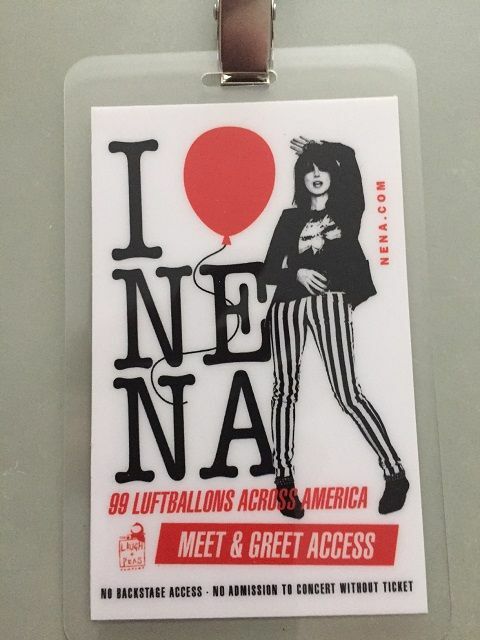 As the show neared the end, she announced that her next song would be "99 Luftballons", and quite by surprise, original Nena keyboardist Ewe Fahrenkrog-Petersen had made the trip to NYC, and would join Nena for the rest of the show. 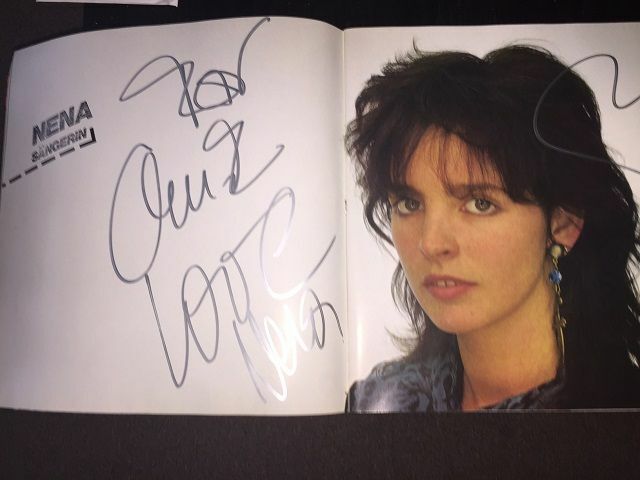 One small nod to her former group, she changed the lyrics at the end of "99 Luftballons" from "Found a balloon, Think of you and let it fly " to "found a balloon, think of Rolf, Carlos, Ewe, and Jurgen, and let it fly"
After "99 Luftballons" she came back for a two song encore, and then ended the show. The meet & great, unfortunately was rushed. A large group paid the extra for M & G, and time was limited. I did get to meet Nena, hug her, and tell her I've waited 34 years for this show. She was very sweet, enjoyed talking with everyone, and was surprised at the amount of American fans who showed up for her show. The laminated tags we were given as proof of purchase for the Meet & Greet. 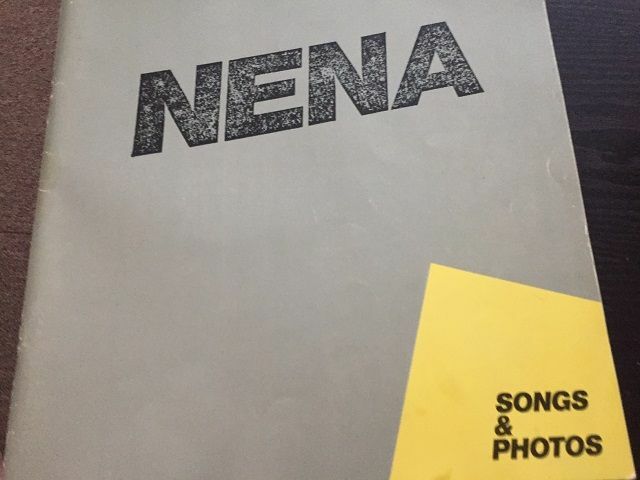 This is my "Nena Songs & Photos" book. I got this back in the 80s, it was in the back of a vinyl single I got at an import record store. 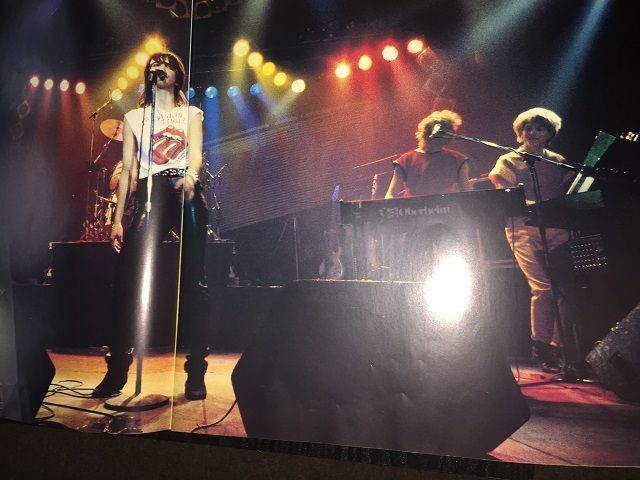 This is a shot from inside the book. This is where Nena signed my book...."To Chuck, love, Nena" . In the upper right hand corner she hurriedly drew a heart. Nice list. What is it?